Professional blenders are perfect for healthy juice bars, milkshake cafés and cocktail bars. 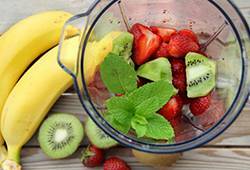 It doesn't matter if you're looking to make a healthy vegetable soup or a naughty strawberry milkshake, a commercial food blender has the power to crush ice and nuts as well as fruit and veg - so you'll get fast results everytime! Available with digital or analogue controls, our tabletop blenders are easy to use and put you in control of the blending speed - perfect if you're looking for a smooth or chunky consistency. Plus they come with smoothie cups, lids and straws so you can start trying out milkshakes, juices, frappés and smoothies straight away!